Or view larger version. Let a thousand parks bloom. 1969. Frank Cieciorka, artist. Poster. Collection of Oakland Museum of California, All of Us or None Archive. Gift of the Rossman Family. 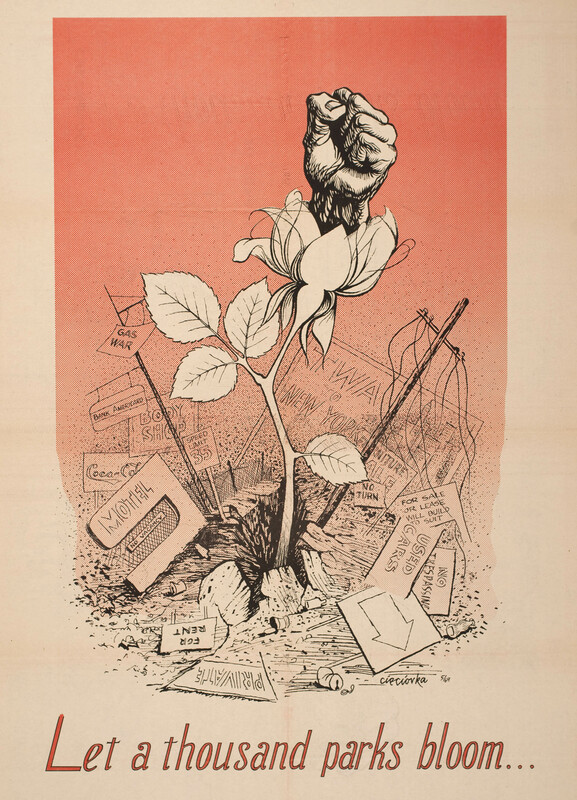 In this mass-produced street poster on cheap newsprint, a lone fist/flower rises out of the rubble, an iconic symbol of resistance. Escalating aggressive law enforcement tactics over People’s Park culminated in the use of National Guard troops; the ensuing riots resulted the death of an innocent bystander. The struggle was an epic one, pitting flower-planting hippies against baton-wielding troops, and reflected the deepening social divide gripping the nation. The title is a variation of the Chinese leader Mao Zedong’s 1957 popular quotation "Let a hundred flowers blossom…" This clenched fist created by Cieciorka in 1965 was widely adopted as a movement icon.